About two years ago, I was in a YouTube video called What kind of Asian are you? It was inspired by a funny little moment that happened at a party and had happened many times before. We thought it would be a good laugh to turn the tables just once, and so the video was born. I knew it would resonate most definitely with Asian Americans, but I had no idea what a ride it would take me on. I was born and raised in Southern California, the youngest of three daughters of Korean immigrant parents who came to the United Stated with a single suitcase, so the story goes. We were among just a very small handful of Asians living in a very white community, but Iʼd say it was normal enough. There were things that definitely made us stand out from the rest of the neighborhood. Among them, the smell that would seep from our kimchee-filled refrigerator, my grandfather who would pick me up from school and speak to me in Korean in a tone that always sounded like he was yelling, my momʼs broken English and thick Korean accent that would almost always lead to the McDonaldʼs clerk on the other end of the drive-thru speaker asking us to repeat our order until we had to yell it over the shoulder of my pissed-off mom. While my parents made an effort for us to maintain a sense of our Korean heritage, I think their main priority was that their children assimilate and be accepted as American. Every night, my mom would make 2 dinners – one for herself and my dad, which would be the typical Korean fare of bap and panchan, and one for me and my sisters, which varied between spaghetti, enchiladas, hamburgers and frozen TV dinners. Although they spoke only Korean in the house to each other, we were never forced to speak it. While other Korean family friends went to Korean school on the weekends, I was twirling around in dance class. My relatively normal and happy childhood was also filled with embarrassing moments: being greeted with Konichiwa by total strangers; being stopped by old men who wanted me to know that they served in the Korean War; and dealing with people shocked that I had no trace of an accent no matter how many times I repeated that I was born here. Looking back, I find it perplexing and even a bit heart-breaking, that my parents tried so hard for us to be regular American kids because no matter what, we would encounter moments like these that reminded us we were not. Anyway, it was all for the best, because thatʼs who I am … Korean first and then American. Following the release of the video, the outpouring of response was overwhelming. Just a few weeks after it was uploaded on YouTube, I was contacted by a Korean production company looking for a non-native Korean to play a role in one of their films. A few months later I was on a plane to Korea to play the part of Maksoon in JK Younʼs Ode to My Father (Gukje Shijang). The film depicts the story of a manʼs journey to take care of his family and keep his promise to his father, set during the end of the Korean War and moving through the next few decades into the present. Basically it was the story of my parentsʼ and grandparentsʼ generations, a story I didnʼt know much about. A lot of my parentsʼ past is a mystery, particularly my fatherʼs. Growing up, my dad wasnʼt all that emotional and communicative, but it was definitely his pride and lifeʼs duty to be the breadwinner and provider for his family. Getting to be a part of this film gave me a tiny peek into my parentsʼ lives when they were kids, trying to figure out life and love, all against the backdrop of a time and place that was quite literally foreign to me. About a year after shooting the movie, it was released in Korea and in December of 2014, I took my family to see it at a theatre in Koreatown, here in LA. As soon as the movie started, I was swept up in the story of Koreaʼs history, and more importantly, the story of my own parents. Afterwards, I sat with my family at a cafe next door and my mother began telling us stories she had never shared before. She talked about being a young girl growing up during war and having to leave college early to help support her family by taking a job in Saigon, Vietnam, where she eventually met my father. I was deeply touched as well as embarrassed since most of my life, I hadnʼt really attempted to engage her in a conversation about these aspects of her life. Iʼm still processing the whole experience, but the video leading to the movie was like kismet. This whole crazy thing has led me on a journey of discovery and understanding about my family, my identity, my culture. And after all these years, Iʼm finally seeing my parents as people who were incredibly brave and resilient. They lived through some challenging times that defined who they were and set them off on a path that resulted in me having a pretty awesome life. I have a renewed appreciation for who I am and how I got here. With the video getting so much attention and the subsequent journey back to my roots that ensued, I feel a little pressure that thereʼs an expectation that I speak with some authority on issues of identity, culture, and race. Iʼve never been one to want to rock the boat or offend anyone or state publicly my opinion on really anything, for that matter. When I was asked to do an interview on the Huffington Post live, right after the video was released, I was terrified to be part of a conversation that up to this point, I had felt I didn’t have anything worthwhile to offer. I confess, I was just trying to get a laugh! Things happen for a reason, I am learning. Look, Iʼm writing this blog post. I am now more inclined to join in the conversation and not be so reluctant to have a bigger voice in it. Everyone has a story. I think it makes a difference to share, acknowledge, listen and be heard. And if you can do it and make someone laugh ʻtil they pee, then even better. Author Bio: Stella Choe is native of Southern California and started her career as a dancer. She has worked on film, TV, and stage. Credits include The Replacements, The Muppets, The Curious Case of Benjamin Button, Two and a Half Men, and Paul McCartney’s World Tour 2001. 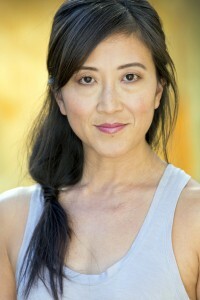 She continues to work as a dancer/choreographer, writer, and actress.